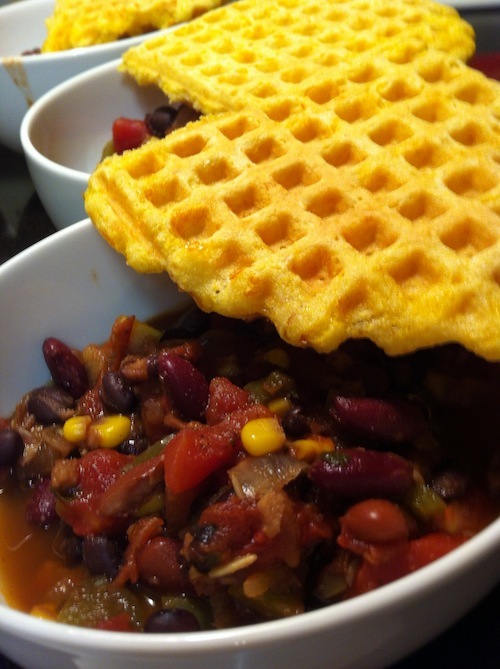 I was making my favorite vegetarian chili again for an event, but wanted something new and different to go with it, so I decided to change up the usual cornbread muffins and make these waffles. This was a fun recipe. It comes together quickly and gets some extra use out of your waffle iron that might be getting a little dusty in between brunches. These felt really dense, but tasted fluffy. It’s a great combo and they went with the chili perfectly. Definitely would make them again. In a large bowl, combine flour, cornmeal, baking powder, baking soda, salt, and cheddar. In a separate bowl, whisk together the eggs, buttermilk, maple syrup, and melted butter. Preheat your greased waffle iron to medium-high heat. Combine wet ingredients with the dry and mix until just combined. When waffle iron is hot, scoop batter onto the iron and spread around until there’s an even layer. Close and cook for about 3-4 minutes, until waffle is golden. 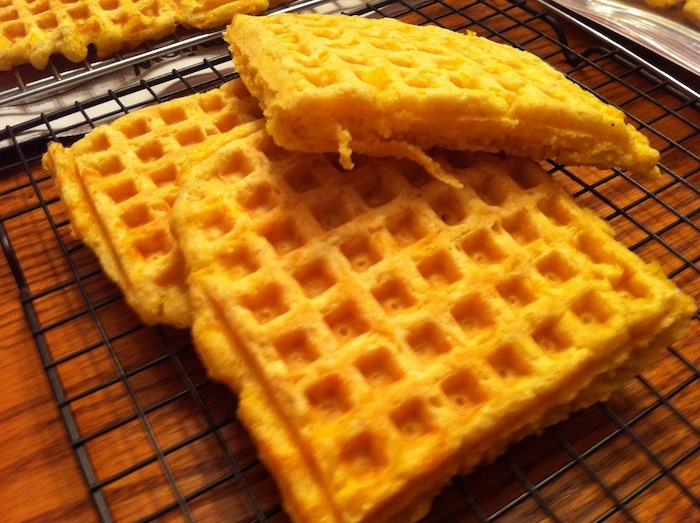 Remove from waffle iron to a cooling rack. Repeat until batter is gone. Serve hot. These sound like a thing I would want to eat all day. And I’m not a waffle girl. But I think that’s because I always knew in my heart that they should be made of things that are more delicious. Like cheddar.